Some hydroponic gardeners need help with pollinating there hydroponic systems weather the garden is indoor or outdoor. But especially in indoor gardens like greenhouses and basement gardens because obviously there are no bees there to help pollinate their plants, and depending on the type of plant, or how many plants, hand pollinating can be a problem as well. In recent years some have been turning to the “Blue Bottle Flies” to pollinate their crops instead of bees. Blue Bottle Flies are from the Blow Fly family. There larger than regular house flies, and grow about half an inch long. Their head and thorax (front and middle sections) are gray, the abdomen (large rear section) is bright metallic blue. They have red eyes and clear wings. Flies don’t intentionally go around pollinating flowers, they just manage to do that do that while their flying from flower to flower looking for good resting spots. Like other fly’s the Blue Bottle fly is a meat eater and feeds from dead animals or and prefers fresh meat. They even feed on living animals with open wounds, animal poop, and other decaying matter. Although meat fly by nature, the Blue Bottle fly loves the nectar of flowers too. So they wind up pollinating the flowers unintentionally while they are looking for a little sweet drink. Whereas bees intentionally search out flowers to get nectar from, then take it back to their hive. As a added benefit fly’s work at cooler temperature than bees do, so they are even more beneficial in cooler climates, and to cool weather crops. 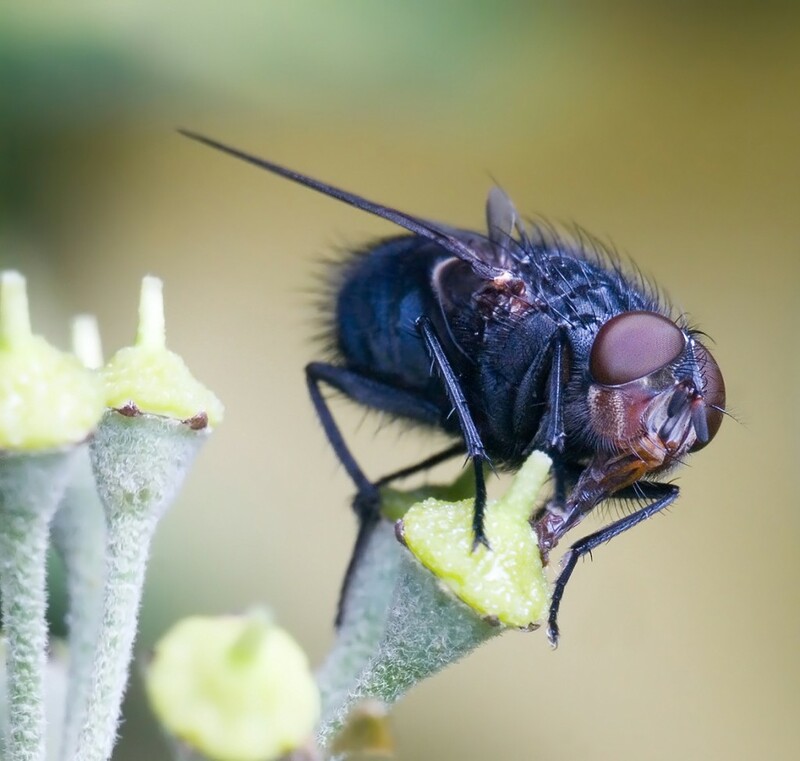 Even though the Blue Bottle fly may earn their keep, they still can’t escape the reputation of being fly’s. They can still be irritating to many people, even though they wont sting you. So it wouldn’t be a preferred method of pollinating in a house and/or near doors and windows where they could easily get into the home. The fly’s work best in caged area’s like greenhouses because they are basically trapped. Once a fly leaves the area it does not generally return like bees will. The nectar in the flowers is a food source to bees, so they keep coming back looking for the food. For fly’s, meat is the food source, and the sweet nectar is just a nice extra if it happens to be in the area. 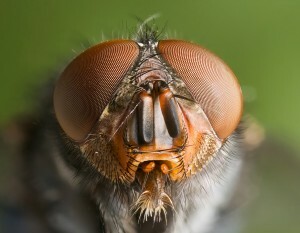 Typically the more pungent or bad smelling something is, the more fly’s (Blue Bottle fly included) are attracted to it. Because the fly’s are attracted to meat you can encourage them to stick around in the area with meat, fresh meat works best rather than already decomposing meat. Because fish tends to have a stronger odor, it usually attracts them best. They will also lay there eggs directly on the meat, producing another batch of fly’s to pollinate your flowers later. Compared to bees, flies have a much shorter life span, and are considered to be a short-term pollinator. They will need to be replaced often if pollinating continually flowering plants, like peppers or strawberry’s. Even though fly’s have a short life span, from around 7 to 30 days depending on environment, you can breed them rather than buying more all the time. After mating, the female Blue Bottle Flies lays her eggs in the same place where she feeds (on dead animal flesh, fresh meat, animals open wounds, poop etc..). 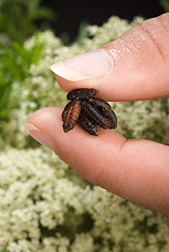 Then the eggs quickly hatch, and the young larvae, called maggots, eat immediately. The maggots are whitish in color, with small black hooks to tear flesh with. After a week or so of feeding, the larvae (maggots) crawl away to a dry place and burrow a little ways into soil. They then become pupae (resting stage). The pupae are tough brown cocoons. This pupae is what you buy when buying these fly’s from a vender. The fly’s are in a hibernating/dormant stage at this point, and can be stored up to 3 months in refrigeration. After taking them out of refrigeration, adult Blue Bottle Flies come out of the pupae in about two or three weeks. They will breed often during the warm months, and both larvae and pupae can live through the winter, but adults die when it gets too cold. They will become active again when temperatures rise above 50 degrees during the day.